Catcher Tim DeCinces played eight seasons in the Orioles, Padres, A's and Indians organizations. His best season was 1998, when he hit .267 with 16 HR and 64 RBI at Frederick. Now a real estate agent at HOM Sotheby's International Realty in Newport Beach, CA, he kindly answered my questions about baseball cards. "I did collect cards when I was a kid. My favorite in my collection was a Rod Carew rookie card. The Baseball America prospect card is my favorite one of me. I was really honored to be recognized in that set." Outfielder Rick Parker played parts of six seasons in the major leagues for the Giants, Astros, Mets and Dodgers. Now the Broker/Officer for Parker Team - Keller Williams Realty in Independence, MO, he kindly answered my questions about baseball cards. The 1990 Upper Deck card - that's my favorite. I broke my nose the day fielding ground balls in San Fran before the game and I have two black eyes in the picture on the front. Yes, my 1990 Upper Deck, my wife likes the picture on the back. Yes, I have many old cards like Mickey Mantle, Hank Aaron, Pete Rose, George Brett - rookie, Robin Yount - rookie. Thanks! He broke his nose on June 16, 1990. The next day, he pinch hit against Tom Glavine in the bottom of the sixth inning with the Giants trailing the Braves, 6-5. He singled, went to second and third on two groundouts, and then scored on a single by Kevin Mitchell to tie the game. The next inning Parker was replaced in a double-switch. The Giants went on to win, 9-7. 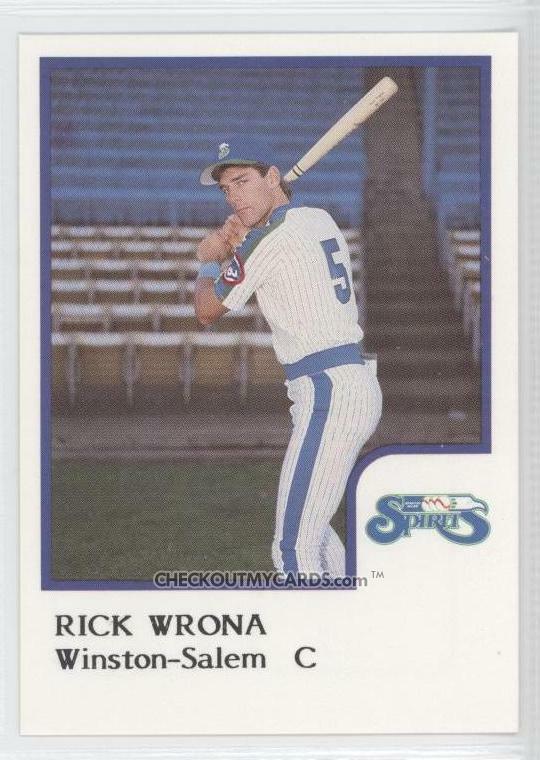 Catcher Rick Wrona played parts of six seasons in the major leagues for the Cubs, Reds, White Sox and Brewers. He now works for Metals USA and is a youth baseball coach. He kindly answered my questions about baseball cards. "I collected a few box sets in '89 and '90 when I was a rookie just to save for my kids, but I wasn't into it big time. Most of the box sets I had were given to me while I attended card shows to sign autographs. I used to pose for a lot of cards batting left handed and they actually printed one. It's a '90 or '91 card with the Cubs. My last card, '93, while with the Reds is cool and unique. I'm holding a 300mm telescoping camera during a rain delay in Cincy and it got on a card. It was probably the only action photo they could find of me that year with the Reds as I was the third catcher and rarely played." First baseman A.J. Zapp played eleven seasons of professional baseball, mostly in the Braves and Mariners organizations. His best season was 2004, when he hit .291 with 29 HR and 101 RBI at AAA Tacoma. Now a youth baseball coach and the Southern Indiana Sales Rep for LIDS Team Sports, he kindly answered my questions about baseball cards. I coach my 9 year old son’s baseball team and give out 2 packs after every game to the two most valuable players. My Topps rookie card with Jason Marquis. I collected baseball cards when I was a kid. Now my 9 year old son collects them. I think I have all of my cards! I have one card of Kirk Baldwin, from 1989 Best. Playing career: Kirk Baldwin pitched in 20 games in the Royals organization from 1989 to 1990, going 1-5 with a 5.75 ERA. Where he is now: A professional land surveyor in Missouri. Google Autocomplete results: He is fourth when you type Kirk Bal, between Kirk Balden, an artist, and Kirk Ball, referring to a manufacturer of panning ball heads. There are no references to the ballplayer on the first page of Google results; most are for an insurance agent in Utah. Coming up next: The next profile will be Jeff Ball. I have one card of James Baldwin III, from 2011 Topps Pro Debut. Playing career: The Dodgers fourth round draft choice in 2010, James Baldwin III has advanced slowly through the team’s minor league system. His biggest asset is his speed. In 2012 he played at Class-A Great Lakes, hitting .209 with 7 HR, 40 RBI and 53 SB. Where he is now: He is back at Great Lakes for 2013, hitting .224 with 3 HR, 9 RBI and only one stolen base. Interesting facts: Son of former White Sox pitcher James Baldwin Jr.
Google Autocomplete results: He is fifth when you type James Baldwin I, between James Baldwin in Paris and James Baldwin in France, both of which refer to the writer. There do not appear to be any other prominent James Baldwin III’s. Coming up next: The next profile will be Kirk Baldwin. I have one card of Aaron Baker, from 2011 Bowman Chrome Prospects. Playing career: First baseman Aaron Baker was the Pirates eleventh round draft choice in 2009. Two years later, he was sent to the Orioles in the Derrek Lee trade. In 2012 he hit .266 with 22 HR and 72 RBI in the Orioles A team in Frederick. Where he is now: In 17 games at AA Bowie he is hitting .265 with 3 HR and 4 RBI. Google Autocomplete results: He is eighth when you type Aaron Ba, between Aaron Barrett, singer for the band Reel Big Fish, and Aaron Basha Prices, referring to a jeweler. The first result is not the ballplayer but a personal trainer. Coming up next: The next profile will be James Baldwin III. A minor league affiliate of the Padres. There are some nice photos in this set. The front of these cards are brought to you by Pepsi. The backs are brought to you by KLSR-TV Fox 34. This was the Padres rookie league team. Several photos were taken in front of this cannon. Anyone familiar with it? The players are in road jerseys so I wonder if this cannon is not actually in Idaho Falls. There are a lot of action photos in this set, including this night card. Those are some high-scoring playoff games. The Beavers were the AAA team for the Minnesota Twins. I love the notepad design. Unfortunately, the photos for this set were pretty bland. The most interesting parts were the ads in the backgrounds, with photos taken in front of either a swimmer diving into a hot dog or a giant cutout of the Marlboro man. Jim Dwyer looks like a grizzled old baseball man who has been coaching for decades. Actually, he was only 40 years old and had played in the majors the previous season. Check out my newest post on The Hall of Very Good - and a chance to win a free DVD of the movie Knuckleball. The Stars were the AAA affiliate of the San Diego Padres. Benito Santiago was the big star in the set. Weird to see Steve Kemp in a Padres uniform. He never played in the major leagues with San Diego. The front of Steve Lubratich's card gives no indication of his role with the team. Maybe the back will be more informative? Nope. For the record, after playing 64 games for the Stars in 1985, he spent 1986 with the Padres AA team in Beaumont, playing 45 games. There were lots of cards with pitchers batting, some with helmets. There was only one card of a pitcher posing as a catcher. There's Mike Schmidt in his minor league days turning a double play! The Matt Clement and Gary Matthews Jr cards on the right were from an update set for the 1997 Rancho Cucamonga Quakes. There were actually two of these 7-card sets so one is up for trade. And not every card was a Padre - there were two cards from the 1984 Prince William Pirates. Very cool. I have one card of Tom Baine, from 1989 ProCards. Playing career: Outfielder Tom Baine played five seasons in the Cardinals and Twins organizations from 1986 to 1990, hitting .297 with 11 HR, 180 RBI and 47 stolen bases. Where he is now: Anyone know where Tom Baine is now? Google Autocomplete results: Tom Baine Baseball is fifth when you google Tom Baine, between, Tom Baine Jacksonville, a city council candidate, and Tom Baines Junior High, a school in Calgary. The ballplayer is the fourth result when you type Tom Baine. Coming up next: The next profile will be Aaron Baker. I have one card of Lucas Bailey, from 2011 Topps Pro Debut. Playing career: Catcher Lucas Bailey was drafted by the Rays in 2009, and has slowly moved up in their system. He played at Class-A Charlotte in 2012, hitting .237 (bringing his pro BA up to .217) with 7 HR and 28 RBI in 67 games. Where he is now: He is back in Charlotte in 2013. Through six games he is hitting .294 with 4 RBI. Google Autocomplete results: He is second when you type Lucas Bai, between Lucas Baiano, a filmmaker, and Lucas Bain, a musician. Another prominent Lucas Bailey is Executive Creative Director at DraftFCB. Coming up next: The next profile will be Tom Baine. I have one card of Adam Bailey, from 2011 Topps Pro Debut. Playing career: Outfielder Adam Bailey was drafted by the Astros in 2010, and has quickly moved up in their system. Where he is now: He played at three levels in 2012 – 47 games at Class A, 49 games at Class AA, and 2 games at Class AAA. Google Autocomplete results: He is second when you type Adam Bai, between Adam Bain, President of Global Revenue at Twitter, and Adam Bainbridge, an artist. The first entry when you Google Adam Bailey is not the ballplayer but a lawyer in New York. Coming up next: The next profile will be Lucas Bailey. I have one card of Lenny Ayres, from 1990 ProCards. Playing career: Lenny Ayres pitched three seasons in the Giants organization, going 15-14 with a 3.77 ERA. Where he is now: Owner of The Batter’s Box in Kennewick, WA. Google Autocomplete results: He is first when you type Lenny Ay, ahead of Lenny Ayar. There do not appear to be any other prominent Lenny Ayreses. Coming up next: The next profile will be Adam Bailey. I have one card of Josh Ashenbrenner, from 2011 Topps Pro Debut. Playing career: Third baseman Josh Ashenbrenner played in the Tigers organization in 2010 and 2011, hitting .267 with 0 HR and 24 RBI in 84 games. Where he is now: Did not appear to play organized baseball in 2012. Don’t know if he was injured or quit. Google Autocomplete results: He is fifth when you type Josh Ashe, between Josh Asheim, a fitness leader, and Josh Ashenbrenner Baseball. There do not appear to be any other prominent Josh Ashenbrenners. Coming up next: The next profile will be Lenny Ayres. 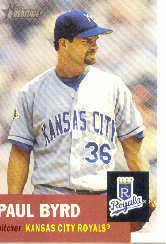 Paul Byrd pitched fourteen seasons in the major leagues, winning 109 games. A three-time 15-game winner, he was a National League All Star with the Phillies in 1999. Now a Braves announcer for Fox Sports South, he kindly answered my questions about baseball cards. - Do you have any stories about cards of yourself or of other players? Yes. As a pitcher, keeping the bucket is when you are shagging balls for batting practice after you pitch. One of my favorite cards is one of Chad Ogea carrying the bucket in shorts and knee high socks... He had no idea he was being photographed and when it came out and he showed us in the locker room, we all laughed. It was hilarious. - Do you have a favorite card of yourself or of another player? My favorite card of myself is 2002 Topps Heritage #213. I think it's cool because it's painted like the cards of the 50's. Old School! Thanks! I don't have the Topps Heritage card, but here is a card of Byrd from my collection. I have one card of J.D. Ashbrook, from 2011 Topps Pro Debut. Playing career: Outfielder J.D. Ashbrook played in 37 games for the White Sox Rookie-League team in Bristol, hitting .218 with 2 HR and 12 RBI. Where he is now: Works for Toyota in Kentucky, assembling Camrys and Venzas. Google Autocomplete results: J.D. Ashbrook does not appear in Google Autocomplete. There do not appear to be any other prominent J.D. Ashbrooks. Coming up next: The next profile will be Josh Ashenbrenner. I have one card of Jason Angel, from 1993 Front Row. Playing career: Jason Angel pitched three seasons in the Reds organization, going 14-13 with a 5.18 ERA. Maybe he would have had better luck if he was drafted by California. Where he is now: An Account Executive at Covidien in Richmond, VA, specializing in hernia equipment. Google Autocomplete results: Jason Angel is sixth when you type Jason Angel , between Jason Angel Chase, a loan officer, and Jason Angel . The first entry when you google Jason Angel is not the ballplayer but the Director of Partnerships at Accentus. Coming up next: The next profile will be J.D. Ashbrook. A lifetime .300 hitter, Pedro Guerrero played fifteen years in the major leagues for the Dodgers and Cardinals. A five-time All-Star, his best season was 1985, when he led the National League in both slugging and on-base percentage as he hit .320 with 33 HR and 87 RBI to lead the Dodgers into the playoffs. He can now be found on Twitter (see my note below) as @PedroGuerreroLA, and he kindly answered my questions about baseball cards. "I really don't collect cards. I always thought that Canseco '86 card would be the s**t but i guess not. I liked the 80s cards." So it turns out that the 2001 Topps set I bought was not a 2001 Topps set at all - it was a 2001 Topps Home Team Advantage set. The cards are identical to the base set except for "Home Team Advantage" logo over part of the photo. I was totally unfamiliar with this before I opened the box last night. Now I have a conundrum. Should I consider these the same as base set cards, or as a whole different set? As you may know, I like to collect everything, mainly trying to complete sets. I keep all my cards in boxes in chronological order by set (i.e. all my Bowmans, then all my Collectors Choice, then all my Donrusses, etc.). I have generally considered parallel cards to be a different set than the base set. For example, after my 1992 Topps set, I have my 1992 Topps Gold cards, then my 1992 Topps Gold Winners cards. Similar for things like Upper Deck Electric Diamond or Ultra Gold Medallion. There have been a couple of exceptions to this rule - I consider red-back and white-back 2007 Topps cards the same, and tiffany-back and plain-back 1990 Topps Traded cards the same. However, both of those variations only cover the back of the card, not the front. If I followed this logic that I have applied to my collection already, I would put this 790+ parallel set after my base 2001 Topps set (I think I have about 300-400 cards from the set already). Then I would still need the other few hundred cards from 2001 Topps, which is disappointing because I figured I now had the complete set I thought about just buying a 2001 Topps base set, but they are expensive - average sale on eBay is over $50 according to Wrigley Wax's very helpful complete set eBay sale watch. I am unlikely to get one for under $10 any time soon. Instead, I am leaning to considering the HTA set the same as the base set for my collection, keeping all the HTA cards (so all the cards in my set look the same) and put all of my 2001 Topps singles (which do not have the HTA logo) up for trade. However, I would be interested to know what you blog-readers think, if that is a good idea or not. Another thought - do any of you have all (or almost all) of the 2001 Topps set to trade? I picked up two hauls of cards on Saturday. 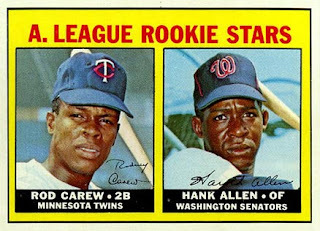 One was the Topps sets I bought from a guy on Craigslist. Earlier that day I got a whole bunch of cards from someone on Freecycle. I had gotten cards from her last year, and she had more to give away. No ten Frank Robinson autographs, but some really cool stuff nonetheless. All of you collectors, especially those like me who aren't team or player specific but love all baseball cards, really need to be on those sites. People who were hoarding their collections for years looking to get rich off of them are realizing their cards aren't worth anything, except for those like us bloggers who love the cards for their own sake, not their monetary value. Here is what I got - some of it is for show-off purposes, a lot is trade bait. - There were a bunch of these cans of Pinnacle Inside. I've never gotten any before - I guess I will need a can opener to get at the cards? Weird. - There are two postcards of Hall-of-Fame plaques - Roberto Clemente and Mickey Mantle. I don't collect postcards so they are up for trade. - Next to the postcards is a Willie Stargell tribute set from Sunoco - there were two in the lot so one is up for trade. - Under that are autographed cards of Willie Stargell and Brooks Robinson. That is to show off, not for trade. Pretty cool, especially since you can't get autographed cards of Willie Stargell any more. - There was a whole box of the 1993 Upper Deck BAT set of retired baseball legends. The last time I got cards from this person there was a complete set of these, so I don't need any more. I haven't gone through what's in the box, so I don't know if it's a complete set or not. Either way they're up for trade. - The box on the right had a whole bunch of star cards in plastic. The cards I took out and put on top are all trade bait. - The brown box appears to have complete sets of all three years of Topps Big Baseball ('88, '89 and '90). I will have a lot of dupes and so plenty to trade. - The '89 and '90 Topps Traded sets are up for trade. - The other three boxes were loose cards from 94 and 95 UD and 95 Collectors Choice. Plenty to trade from those sets especially Collectors Choice since I have the full set. This is to show off - four signed cards of stars from the '69 Mets (plus an unsigned Tom Seaver). I'm a Yankee fan but I can appreciate that this is cool to get, especially for free. Finally, there were several binders of 8.5 x 11 photos, mostly from Front Row or Spectrum. They look like they are designed for autographs but none are signed. Most are star quarterbacks but there are a few baseball legends as well. I don't collect these so they are available for trade. There were a lot of loose cards too, many in the junk wax category but plenty of interesting stuff too. I am going to have a lot to trade from these sets once they are sorted, so let me know if you have needs from these sets! Jacob Shumate pitched eight years of professional baseball, mostly in the Braves organization, winning 14 games and striking out 323 batters in 313 innings. Now a math teacher at Marlboro County High School in South Carolina, he kindly answered my questions about baseball cards. I remember being a young kid playing baseball in little league and dreaming of having my very own baseball card. Suddenly, I was 18, graduating high school and being a first round draft pick in the same day. Not long after that the baseball card deals started coming in. I can remember how excited I was to have actual REAL baseball cards of myself. It was so surreal for me and I have each of the cards of me that I am aware of in a case at my parents house. I remember taking the pictures for my Topps cards during my first ever road trip in professional baseball. We were in Bluefield, West Virginia. The photographer picked me up at the hotel and we went to the stadium to take the shots. That was a great experience, made me feel like some kind of star at 18. Great feeling. I signed a deal with Signature Rookies to autograph some of their cards of me for $1 each. Joke was on me, they sent me 10,000 cards. Talk about overwhelming, my hand stayed cramped all of the time. In one of the boxes, they accidentally sent 2 cards of another player. I can't remember the name, Paul something, but my roommate and I had some fun with those cards. We autographed them for him, so to speak, and it was a riot. I doubt those cards ever made it into circulation, but if they did i would love to know what their worth is! My students absolutely have a field day when they run across my cards, usually on the internet. They come in the next day make me pull up their discovery on the lcd projector for the class to see. They stare in amazement that their teacher actually has baseball cards. Some of them have parents that have cards of mine that I have signed and bring it to school like its show and tell day. The looks on their faces in both situations is classic! The first question they ask me when they find out I played professional baseball is "Hey do you have any cards?" I really don't collect cards so I really don't have a particular favorite of another player. I do remember when I was young that Billy Ripken's card with the message on the knob of the bat was a deal to me and my friends. We couldn't believe that made it onto an actual baseball card. As far as my cards go, my favorites are probably the Topps cards because they were the first ones I took pictures for and it was such a good experience. I will always cherish those. As I mentioned, I really don't collect baseball cards. Some of my students do, and they love to come across my cards in shops or on the internet. They just cant believe that i actually did what I did before I started teaching high school. It amazes them! Thanks! There were three Pauls in the Signature Rookie Set - Paul Konerko, Paul Wilson, and Paul Failla, who played in the Angels system, the NFL, the AFL and the XFL. Darrell Jackson pitched five seasons for the Minnesota Twins, winning 20 games in the major leagues. He is now the Founder and President of the 10-20 Club, which provides early intervention to youth at-risk for joining gangs, as well as classes and other community service offerings in Downey, CA. He kindly answered my questions about baseball cards. "I like the card of my high school teammate Eddie Murray which mentions the fact that we went to high school together. Also there is a card of mine that has a minor mistake that has me wearing a red hat with a blue road uniform. The hat should be blue. I personally do not collect cards because a value is placed on them by collectors. A card worth 5 cents on the market is priceless to the player who worked hard to make it to the major leagues. I collect the cards of all the players who I played with in Compton California. Ken Landreaux,Ozzie Smith,Lonnie Smith, Derrel Thomas,Dan Ford, Chet Lemon, Rick Peters, Blue Moon Odom and Hubie Brooks as well as Bob Pate!" I have one card of Warren Arrington, from 1987 ProCards. Playing career: Outfielder Warren Arrington played three seasons in the Cubs organization from 1987 to 1989, hitting .244 with 6 HR, 94 RBI and 89 stolen bases. Where he is now: Anyone know where Warren Arrington is now? Google Autocomplete results: He is fourth when you type Warren Arr, between Warren Arrasmith, a dentist in Alabama, and Warren Arriola, a senior recruiter at Spas Elites in Chicago. The first entry when you Google Warren Arrington is not the ballplayer but the owner of American Safety Products in North Carolina. Player Profile: Jack Armstrong Jr.